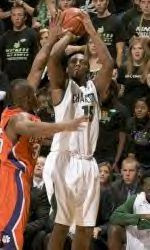 Lamont Mack, last season’s leading scorer for the Charlotte 49ers, has the chance to extend his playing career. Mack, a 6-foot-7, 229-pound forward who graduated in May, signed a two-year contract this week with AEK Athens, one of the most successful professional European basketball teams. Mack is expected to leave for Greece at the end of the month with the A1 League beginning play in mid to late October. Mack is one of three American players on the roster for the team which plays in the 19,000-seat OAKA Olympic Arena. Mack said he was very thankful for the chance he had attending several NBA tryouts over the summer. Mack was a third-team all-Atlantic-10 Conference selection last season during which he averaged 15.2 points and 5.7 rebounds a game and shot 32 percent from 3-point range. I've heard about AEK Athens. Good program. Way to go Mack! Good luck! Hope to see in the NBA soon!